Now that information on Archie #604 is starting to come out, due to advance solicitation dates, the media is picking up on the fact that Archie marrying Veronica is an imaginary story, and there’s going to be a corresponding storyline in which Archie marries Betty, beginning in Archie #603. The New York Times attempted to sensationalize the idea with a story that began “Is Archie Andrews a bigamist?” That ties into a lot of adult reader fantasies when they think about the Archie/Betty/Veronica triangle. Until the wedding story began to unfold, the core readers of “Archie” were female, between the ages of 7 and 17, Mr. Goldwater said. But the new story line has multi-generational appeal, he added, with feedback from readers indicating that the comic had been shared among parents and children. Wow! All because of a wedding? I guess it’s true that they raise ratings. The writer of the story, Michael Uslan, is interviewed, and he reveals “The polls that I’ve seen ran about 80/20, Betty over Veronica, with Jughead continually coming in a strong third.” Let’s see THAT imaginary future! Also mentioned are direct market sales numbers, which for #600 are estimated at “just over 54,000” while #597 sold about 2,500 copies. However, that doesn’t consider newsstand sales, which last year were around 13,000 an issue, or five times the sales in dedicated comic stores. (Archie comics traditionally sell much better to the general public than in the comic market.) So we don’t know whether newsstand sales for this issue had a similar multiplier effect or whether this simply brought the comic to the attention of collectors. 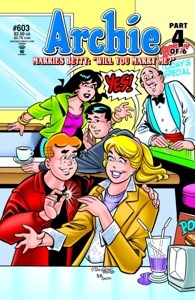 Since the world first found out Archie was getting married, fans everywhere hoped Betty would be the bride. But those fans discovered quickly Archie Andrews chose Veronica Lodge over Betty Cooper and they were angry! They felt Archie had made the wrong choice, and they are very vocal about it! On television, in the newspapers, and on blogs all over the internet, fans loudly rejected Archie’s choice. … They didn’t care that Archie and Veronica are happily married, that he has a good job and that they have twins. It didn’t matter what Archie wants, the fans want Archie to choose Betty! Now Archie Comics will listen to the cry of fans around the world and in ARCHIE #603, Archie Andrews will propose to Betty Cooper! Nice spinning, pretending that this other alternate future follows from the first one. Kind of a shame that Veronica got her proposal in a jewelry store while Betty gets hers in a burger joint, but that’s one of the distinctions between the characters. Jughead doesn’t even appear on this cover. I guess they want to avoid that “third choice” option.